We are halfway through October, which just so happens to be Breast Cancer Awareness Month. Here are some fab ways that you can get around the cause while supporting some pretty fantastic brands that I know and love. One of my all time favourite yoga apparel brands are doing a Breast Cancer Awareness Collection and it's SO cute! Their muscle tanks are my fav - so comfy and versatile for working out or hitting the streets with jeans and sneakers. The minimalist white jumper above has the precious pink heart on the front, and WARRIOR written in a bold hot pink on the back. Obsessed! What's incredible about these pieces is that 100% of the profits from these styles support Susan G Komen Los Angeles in the fight to end breast cancer. How incredible is that? This October S'well is donating 20% of the retail price to support the breast cancer research foundation (BCRF). My personal favourite is the Geode Rose bottle on the left. It has a smooth matte finish and is inspired by rose quartz geode stone which is symbolic of unconditional love. The hot pink bottle in the middle, called Bikini Pink with Silver Cap, can even be personalised. How cool is that!? These bottles are so affordable and good for our planet too, lessoning single use plastic. Deodorant. Something we all use, and need in our lives. If you aren't familiar with their 100% natural, chemical AND toxin free deodorant, read this to learn about how you can lead a more low tox life. Black Chicken Remedies is trying to raise $40k for the National Breast Cancer Foundation by October 31st. So, why not stock up now and purchase the More To Love Addition which has 25% more paste? BCR are also running a contest alongside their fundraiser where you can win $1000 worth of Black Chicken Remedies Products! THAT's it... how good hey?! Imagine winning $1000 worth of BCR natural goodness - and all for simply buying deodorant! Seven years ago, Sally, the owner of SWIISH, was diagnosed with cancer herself. This year Sally has put together SWIISH's first 'Pink I Can' Collection, and it's to die for! 10% of all proceeds will go to the BCNA, Breast Cancer Network Australia. This is a great place to grab some adorable accessories, a few early Christmas presents or a little something to Treat Yo Self. My personal favourite is the rose quartz face roller, which is legit incredible, and under $40! Shop the entire range here. 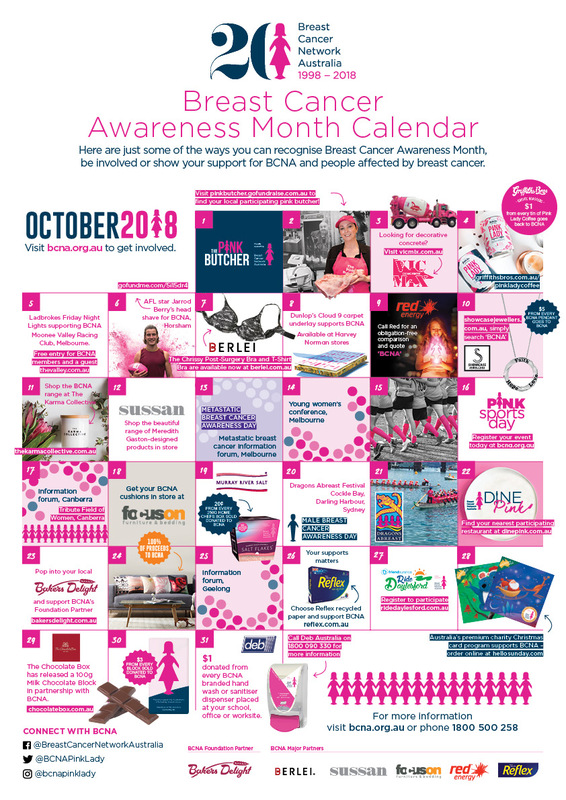 Here is the beacon calendar from Breast Cancer Awareness Australia showcasing other companies and BCA events this month. You don't have to shop help the cause! If you would like to raise money, join/host an event, or volunteer... please click here.